The successful range of hose trolleys by GEKA® has been complemented by a smaller version. The new GEKA® plus hose trolley P25 rounds off the range in the lower area with now 4 different sizes. The small P25 holds nevertheless 50 meters of a 13 mm hose. Of course, you can also mount 15 mm or 19 mm hoses. Its main features are the high operating comfort and easy handling, due to the ergonomic height of the handle and the convenient soft grip, which you can also find at the larger versions. The handle can be assembled and disassembled easily and without tool, so you can store the hose trolley space saving during the winter season. The sturdy, powder-coated steel construction withstands high loads and is designed for a maximum durability. The attractive design finally makes the hose trolley so interesting for all users who want to apply high-quality products in their garden. 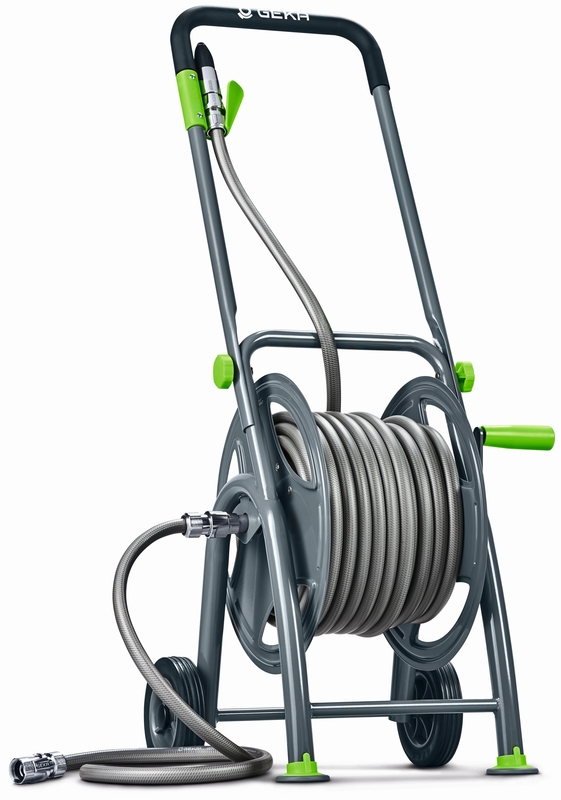 The GEKA® plus hose trolley P25 is available without hose as well as equipped with a high-quality hose and metallic push-fit connector system.